It’s that time again! You are tired of hair on your black leggings, black shoes, sticking to your lipstick, floating through the air and blanketing the floor of your house. You think, “I just need to get through this!” But I’d like to give away some “insider secrets” I’ve learned over the past 30 years of breeding and showing Labradors. Mostly, I’m going to share secrets I learned from my AKC show handler–because when its time for our dogs to earn their title, you CAN’T afford to lose coat!!! No coat–no ribbon. So hears here’s some help for the weary. I’m guessing you all have that wonderful tool called a Furminator, right? NO???? How do you survive without this amazing product? 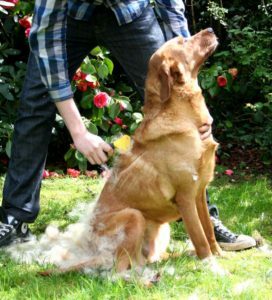 This shedding tool allows you to strip coat down through even the densest layers of your Labradors “double coat” which they have by nature–its a part of why the breed was created–to repel water and be able to swim in icy waters off of the coast of Labrador (the town). Using this tool daily will not only strip out dead coat, but encourages NEW coat to come in, thus speeding up the shedding process. BUT WHAT IF I TOLD YOU YOUR LABRADOR DOES NOT EVEN NEED TO SHED?? I bet I have your attention, now, right?? Here are some secrets! First of all, there is this wonderful supplement my show handler recommended to me when I was getting ready to finish my boy, “Sterling.” Its called SHED NO MORE, and it not only keeps your lab from shedding but HALTS the shedding process even if it has already begun!!! Feed Shed No More chewable tablets directly to your dog or crumble and stir into food.Up to 25 lbs. — 1 tablet in a.m., 1 tablet in p.m.25-60 lbs. — 2 tablets in a.m., 2 tablets in p.m.Over 60 lbs. — 3 tablets in a.m., 3 tablets in p.m.Continue usage throughout the seasonal shedding cycle. Reduced shedding can be seen within the first week! 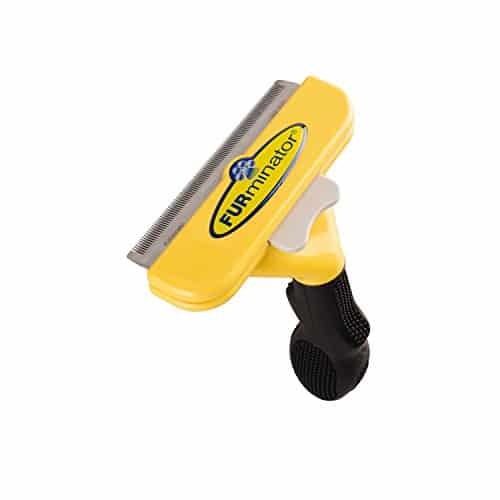 If you would like another addition to your Furminator and get out even MORE coat faster, I totally LOVE and recommend using a horse shedder/scraper--it works AMAZINGLY well. Use it outdoors because you will see clouds of coat fly into the wind while you use it. Gosh, I ADORE that tool! The combination between the Furminator and the shedder/scraper will amaze you! 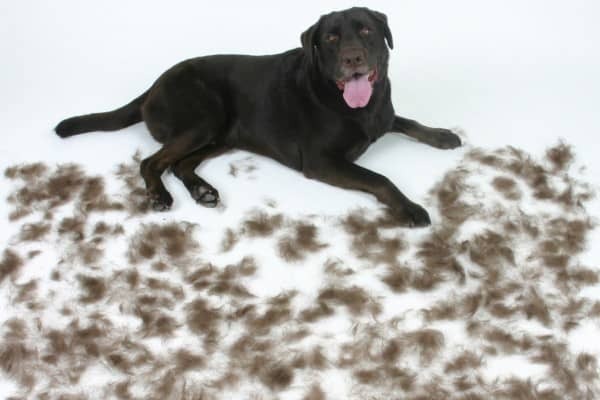 *Provide a cool room for your dog to sleep in, such as a garage or basement–this will assist in stalling the unnatural shedding that happens with indoor dogs. *Provide a species-appropriate high-quality raw/paleo diet that excludes processed carbohydrates–these processed carb ingredients just BEG your dog to shed (they are non-species appropriate for canines). In fact, if you do this alone, you don’t even have to do all of the things above–learn more about BARF (Biologically Appropriate Raw Food) here. Stay away from big box store raw foods that are loaded with carbs and sugars–and avoid freeze-dried food. So, let that vacuum cleaner stay in the closet this spring– and ditch the lint rollers—this shedding season is going to be a cinch!!! 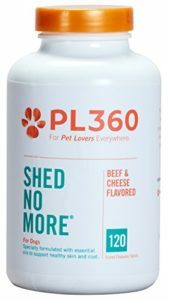 Just started PL360, No More Shed! My husband just ordered the product Donna.